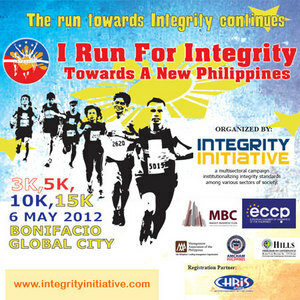 Following the highly successful first running event organized by Integrity Initiative in May last year, the organizers are staging another run on May 6, 2012 at the Bonifacio Global City, Taguig. The Integrity Initiative is a private sector-led campaign that aims to promote common ethical standards among various sectors of society. It operates on the principle of inclusion and collective action, and works to institutionalize and promote honesty, transparency, and fairness in conducting business by using internal and external integrity validation systems. Runners for I Run for Integrity can choose to participate in the 3K, 5K, 10K, and 15K categories. Registration fees are at PHP 550 and PHP 600. Forms can be downloaded here. The European Chamber of Commerce of the Philippines (ECCP) is spearheading the project. The Friedrich Naumann Foundation for Freedom (FNF), a German political foundation that works for the promotion of good governance, is a digital marketing partner of the event and is also participating in the run.